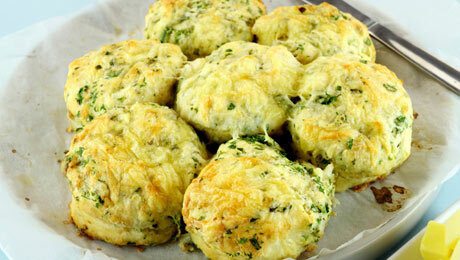 These savory scones are delicious with just butter. Mix the flour, mustard powder, pinch of salt and pepper in a large bowl. Stir in half of the cheese and the sage. Mix the egg and buttermilk together in a separate bowl. Make a well in the centre of the flour mix and pour in all with the exception of a ½ tbsp of the buttermilk mix. Working quickly, stir until the mixture forms a soft, spongy dough. Place onto a lightly floured surface and knead briefly until smooth. Roll out to a square into 3cm-thickness. Place the scones on a floured baking tray, brush with the remaining buttermilk, sprinkle over the remaining cheese and top each with a small sage leaf. Bake for 12-14 mins until they are well risen, golden and sound hollow when tapped on the bottom. Best eaten when warm from the oven with a spread of SuperValu butter.